Last week, I came across a great deal on a sack of malt. Adelbert’s, a local brewery producing a range of traditional and not-so-traditional Belgian ales, recently overstocked on Czech floor-malted pilsner malt, and offered the extra sacks at cost, about 40 bucks, to the homebrewing public. This came as exciting news as I am planning many German lagers and Belgian strong ales during the next few months. After carrying the sack up to my third floor apartment, I used the basic principles from a recent Apartment Brewing Tech post, storing malt. I split the sack into 5 freezer bags, stored air tight and dry. I anticipate to use all the malt within the next 6 months, and through these storage techniques, should get there without much degradation in flavor or extract efficiency. 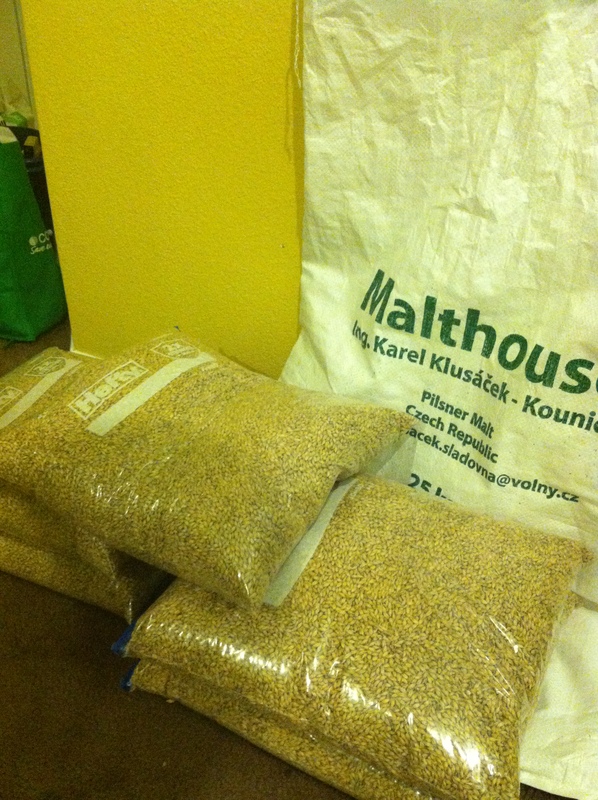 Since I have never brewed with Czech floor-malted pilsner malt, I am planning a SMaSH beer (Single Malt and Single Hop) to familiarize myself with its malt flavors and aromas. From this, I will know whether I need to adjust, add, or substrate any complimentary/speciality malts, in particular the Pilsner/Munich ratios, from my past recipes. 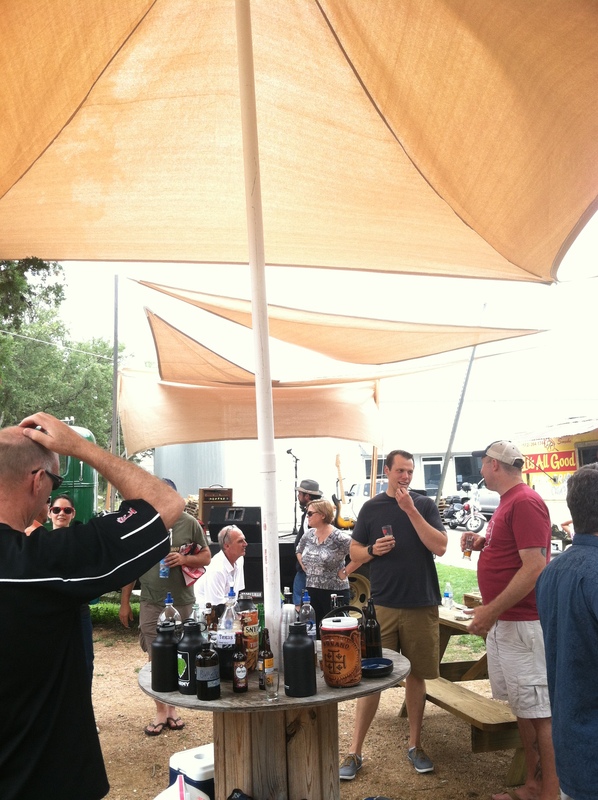 In other happenings, on Saturday, I attended the June monthly meeting of my homebrew club, Austin Zealots. It was held at Infamous Brewing Co. near Lake Travis in Austin, TX, about 30 minutes Northwest of downtown Austin. At the monthly meeting, I sampled many tasty beers, including a few English Milds, Texas Browns, and a wild-fermented Berliner Weisse! Also, I received some good feedback and a few rave reviews on my Session Oatmeal Stout, At 2.9% ABV, many members thought it was a great dark lawnmower beer! Many of the Zelaots weren’t present as they were attending 2014 National Homebrewers Conference in Grand Rapids MI. Our club did well in the final round, winning 3rd place in both Kolsch and Wood-Aged categories. Congrats Kerry and Chris!. This week, brewing operations will be at full steam. At present, both German Pils and Session Helles lagers are at diacetyl rest. Tomorrow, I’ll be kegging both for lagering, and harvesting the yeast for higher gravity batches for brewing later this week. Also, the summer solstice is this Saturday. In celebration, I’ll be brewing a Helles Bock and tasting the one-year old 2013 Summer Solstice Blonde Barleywine. How was your week in brewing? Leave your feedback in the comment section below. Cheers, and happy brewing!